My boys have terrible penmanship. Let's just be honest. So when I was asked if I wanted to review a penmanship workbook, I was all over it!!! Nathan uses the Handwriting Without Tears system and I was so surprised to find out that was a penmanship book option from Bogart Family Resources. Andrew (and next year Rebekah) use the Zane Bloser writing method. I was able to download a Zane Bloser book for Andrew to work with and a Handwriting Without Tears book for Nathan. What I was drawn to was the scriptures involved and the ability to pick things with a Christian flair. 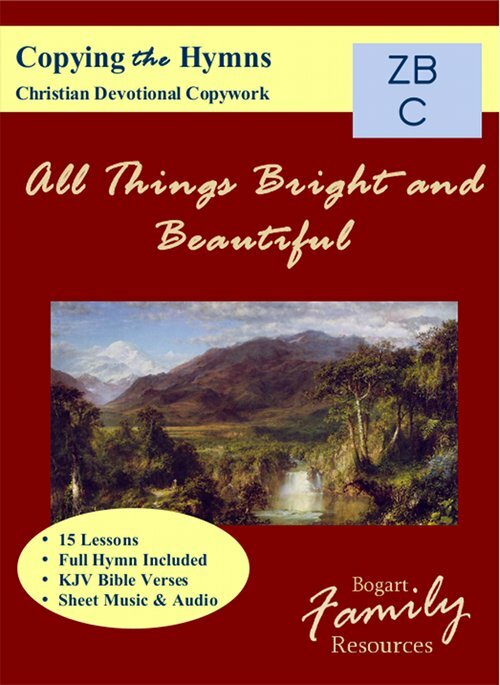 In particular, the All Things Bright and Beautiful book had scriptures to go with the stanzas of the song plus color pages and more. In addition to the copywork you can purchase, you can download a book for free called "What About Penmanship." This ebook helps parents make penmanship choices for your family and includes some free copywork pages. Also, members (who sign up for the mailing list) of our mailing list receive a $5 coupon that they can use to receive any of our copywork titles for free. We send out exclusive, free copywork lessons to our members, deep members-only discounts on new titles, and other great savings. With the copywork books priced between $2.95 to $4.95, it's an excellent resource not only for homeschooling families, but also for parents who want to help their children improve or stay on top of handwriting. I'm thinking of getting more for summer vacation. Would you like to win a copybook? 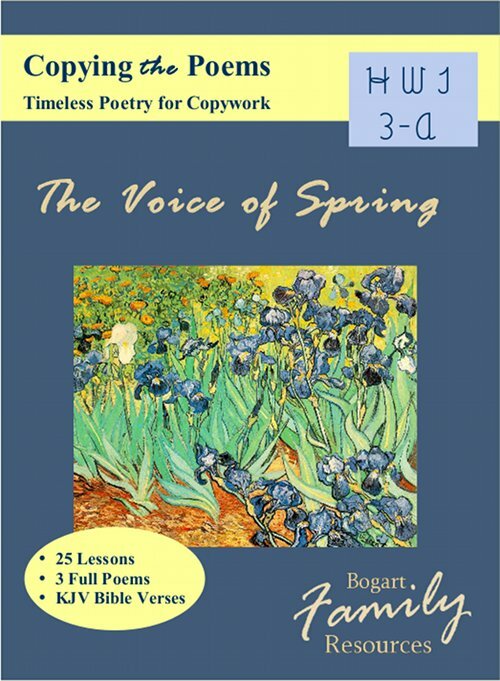 Check out Bogart Family Resources online and let me know which copybook would be your first choice (this is the book you will receive if you win). 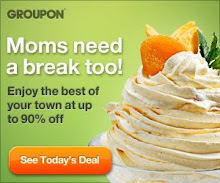 This is a Mama Buzz Review. I was provided a copy of the copybook to try and no other compensation was given. The opinions expressed are solely my own. I like the Copying the hymns one. I am not really clear what level he would need...it would be for Jake...my 10 year old..his handwriting is AWFUL! My only thought is...maybe he'll be a doctor?? ?